The term leech is used in SuperMemo to refer to ill-formulated items. An element is called a leech when it meets user-defined leech criteria such as the number of memory lapses and the current interval. These parameters can be defined when using View : Other : Leeches (Shift+F3). An element becomes a leech when the number of memory lapses passes a defined limit. However, an element is no longer considered a leech if it is remembered beyond a certain interval (independent of the number of lapses). 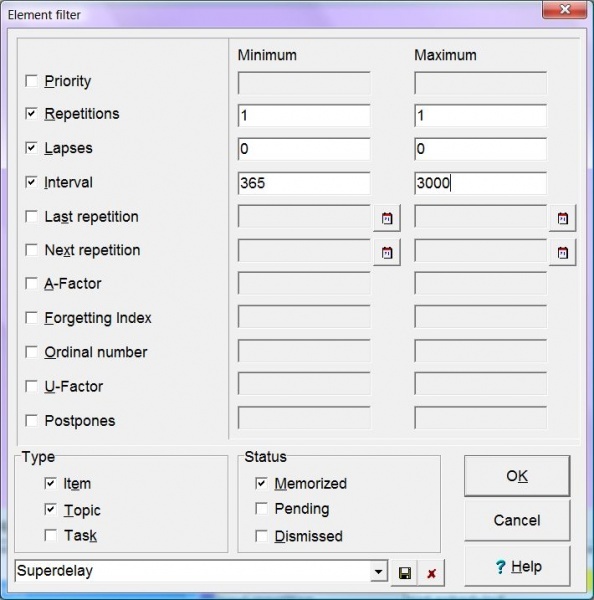 Auto-postpone - upon encountering a leech during repetitions, SuperMemo will automatically reset the learning parameters of the element and schedule it for repetition after a sufficiently long interval. Quite often, taking a break from repetitions of a leech may help overcome an erroneous memory pattern. For example, if you tend to confuse Nigeria and Niger on the African map, taking a 50-100 day break from making repetitions on this subject may actually resolve the confusion by cleaning your memory from erroneous traces. Once you consciously re-memorize the position of both countries on the map, the problem may be solved once and for all. Important! Auto-postpone may also produce infinite leech loops in which you will indefinitely try to postpone ill-structured material never actually solving the problem! Include semi-leeches checkbox can be used to tighten the criteria for a leech warning. A semi-leech is an element that is one memory lapse away from becoming a leech. For example, if a leech is defined as an element with five or more lapses and an interval up to 60 days, an element with four lapses and 1000 day interval will be a semi-leech (because after a single lapse, it will reach 5 lapses combined with a short interval thus becoming a leech). If your collection is well-structured and you do not encounter many leeches, you can turn Include semi-leeches on to tighten leech supervision. If you do not know what to do with a given leech, you can just press Esc and continue with repetitions. Warning! This can easily become a habit and all the idea behind the leech alert will be defeated! Before using Esc becomes automatic, read this text carefully and learn to make your leech-related decisions! The option View : Other : Leeches (Shift+F3) can be used to locate leeches in your collection. 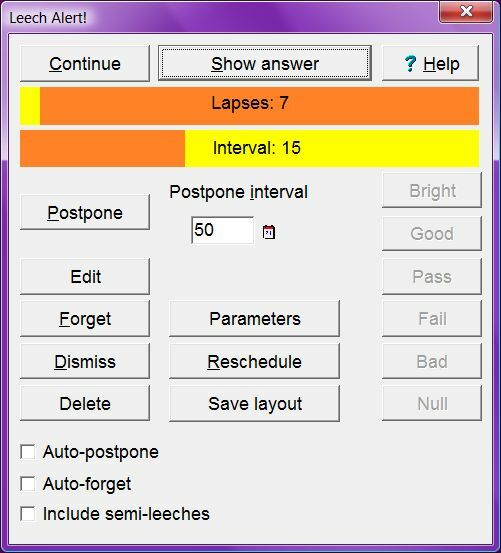 This option uses the element filter dialog box that can be used to find all element meeting a specific set of criteria such as the number of repetitions, number of memory lapses, length of the current interval, status (memorized, pending, or dismissed), type (item, topic or task), etc. The purpose of locating leeches is to reedit most intractable items with a view to applying appropriate mnemonic techniques. Alternatively you can reset elements (e.g. to deal with them later), dismiss them (to use them only as reference, e.g. with Search : Find elements), or simply delete them. A new powerful tool against leeches is a possibility of exporting your leeches to a handheld device (see: Revolution in the pocket). Although, it may seem that pocket repetitions are usually done in conditions of lesser focus, working in the leech-only mode sets your brain onto an emergency alertness level. You approach repetitions differently if recall failure is expected. At time, this is enough to wrap your mind around harder material and gradually reduce the leech load. To maximize the effectiveness of the learning process, you should learn to use View : Other : Leeches and periodically remove from your collection most intractable and badly structured material. If you do not want to use a given criterion, uncheck the check-box associated with a given field. If you do want to use it, check the check-box and specify appropriate minimum and maximum values. By definition, all leeches are memorized items. This is why Type and Status fields of the element filter are disabled. Once you click OK, all leeches meeting the specified criteria will be found and will be displayed in a browser. You can then use Learn in the leech browser (Ctrl+L) to make repetitions in the leech subset only. Using Tools : Random test : Leeches you can run a random test on all leeches. However, you should remember that part of the leech problem is repetition that is too frequent (i.e. causing the spacing effect). This is why Auto-postpone and Auto-forget are so efficient. This is also why leeches are much less of a problem in heavily overloaded Incremental reading. 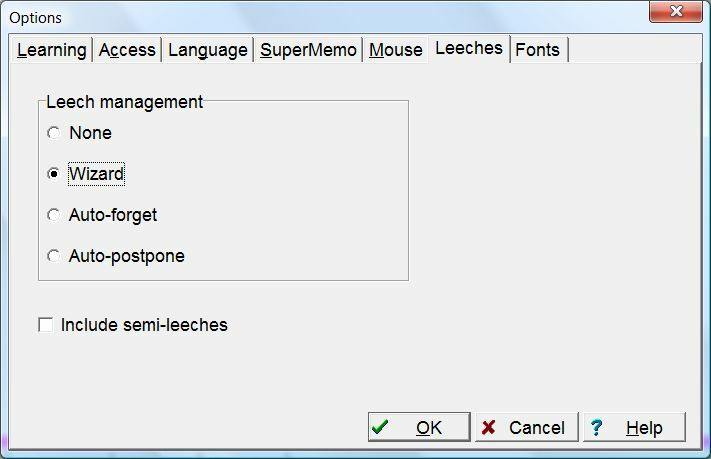 Why can I not choose Include semi-leeches in leech manager for auto-postpone or auto-forget?